2. At the bottom left corner of the window, click the People icon. 3. At the top left of the People window, click New Contact Group. 4. Type in a name for your Contact Group in the Name text box at the top. 5. Add contacts by clicking the Add Members button at the top center of the window. 6. The Add Members button will give you an option to add members from a dropdown list of several options. 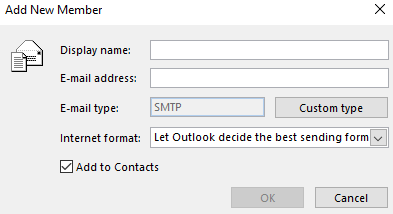 Add from Outlook Contacts: This allows you to add a member from your contacts on Outlook via the Internet. Add from Address Book: This allows you to add a member using your Outlook's local address book. Add New E-mail Contact: This allows you to create a new contact and automatically add it to this contact group. 7. When finished, click Save & Close at the top left corner of the window.